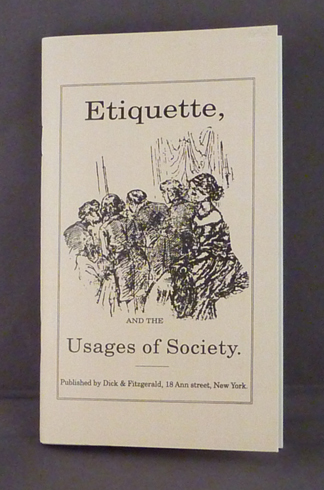 Originally published in 1860, this small guide runs the gamut from shaking hands all the way through marriage (recommended no younger than twenty-five years of age for men and twenty for women). They also include such topics as diverse as ballroom etiquette, types of calls, how to shop, and traveling. And lest anything be omitted, there are even discussions of care of the teeth and, should circumstances dictate, the appropriate method to "cut" an acquaintance.